The Stand Dock simplifies cabling, adding USB and LAN support to your ATIV Smart PC while charging. 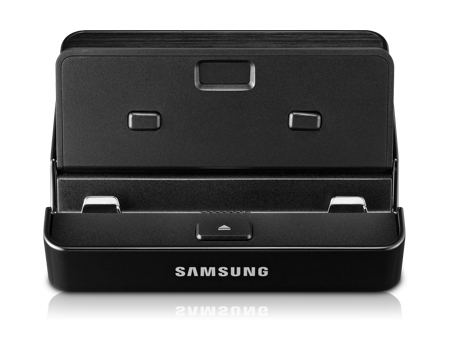 Providing an easy way to connect and charge, the Samsung Stand Dock simplifies cabling and provides a convenient "single-click" connection. The back of the Stand Dock hosts easy access to a wide variety of ports, including USB 2.0, LAN and DC-in (2.5pi). When connected to the Stand Dock with the Power Adapter attached, your ATIV Smart PC can charge so you'll always be powered up and ready to get things done no matter where you're working from. All ports are organized conveniently in the rear of the dock, providing effective cable management. Keeping the Stand Dock at your workspace allows you to avoid having to constantly route wires through or around desks every work session. Adds LAN and USB port functionality to your ATIV Smart PC. Charge your ATIV Smart PC with a convenient "single-click" connection.